Historical fiction is not a genre that I have read very much. However, I am finding it is one of my favorites. The Chaperone by Laura Moriarty didn’t disappoint. I chose this book for book club and was thrilled with the decision. Honestly, I couldn’t put the book down. The author became intrigued after reading a story of silent film star, Louise Brooks. Louise was a dancer. At the age of 15, she was given the opportunity to spend the summer at a prestigious dance academy in New York City. Her father required that she have a chaperone travel with her, but not much was ever mentioned about the chaperone and who she was. The author creates a fascinating character in the chaperone and weaves her in to the story and Louise Brooks life. I understand the author’s fascination with Louise. I found myself researching Louise Brooks, even watching one of her silent films. She was a striking woman who lived life to the fullest. The story begins with Cora Carlisle, a married woman with a past. As a child she was forced aboard an orphan train to a life unknown. The story zig zags between the two womens lives, eventually colliding. The tension between them is suffocating. The story takes the reader on a journey that is unexpected, heartbreaking and intriguing at the same time. Both Clara and Louise learn that they are very different and lived very different lives. Despite the age difference between them, they discover they both need each other for very different reasons. I fell in love with these characters. Finishing the book, I felt a sadness in saying good-bye to these women. The Chaperone is one of those books that I won’t soon forget. I hadn’t heard about the orphan trains that ran across this county. Trains that would take orphans to new homes, families and a strange new life. I discovered a book out there about the orphan trains. It has been added to my personal reading list. For Book Club questions follow the link below. Just a few photos from the Book Club event to inspire you to pull ideas from the book. 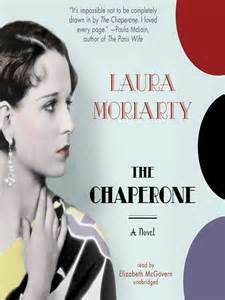 The following link will take you to a video of an interview with the author Laura Moriarty talking about The Chaperone. I have also included a video that was shown at our book club event about Louise Brooks. I would love to hear your thoughts if you have read the book.